If you love bananas foster, you have to try these Bananas Foster Truffles! They taste just like real bananas foster, only served in a luscious, rich chocolate truffle package. How do we manage to cram so much flavor into the truffles? A ripe banana is roasted in a mix of brown sugar, butter, rum, and cinnamon, then all of those flavors are incorporated into the chocolate truffles. These are a decadent, complex truffle that's a lovely change from the traditional plain chocolate truffles. 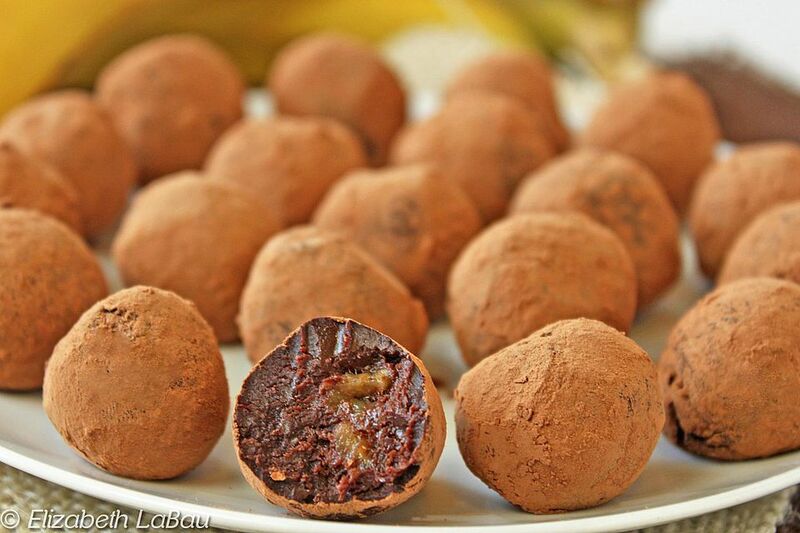 And if you find you love banana-flavored truffles, don't miss these Banana Split Truffles! These truffles can easily be made alcohol-free by substituting your favorite flavored extract for the rum. Place the chopped chocolate in a medium bowl and set aside for now. Melt 2 tablespoons of the butter in a 7" skillet over medium heat. Once melted, add the brown sugar and stir it until the brown sugar melts as well. Add the rum, cinnamon, and nutmeg, and stir until the mixture is bubbling and fragrant. Place the banana slices in the middle of the sugar, and cook them for one minute on each side—no longer, or they will start to get overcooked and mushy. Once cooked on both sides, remove the banana slices from the saucepan. Add the heavy cream to the saucepan—the cream will first cause the sugar to seize and you might have bits of hardened sugar floating in your cream. Whisk the cream and sugar together over the heat until the sugar dissolves, the mixture is smooth, and the cream is almost boiling. Pour the hot cream over the chopped chocolate in the bowl and let it sit and soften the chocolate for one minute. Once softened, whisk the cream and chocolate together until it is smooth and no bits of chocolate remain. Add the remaining 2 tablespoons of butter and whisk it into the chocolate. Chop the roasted bananas into small pieces and stir them into the melted chocolate as well. Press a piece of cling wrap on top of the chocolate and refrigerate it until it is firm enough to scoop, about 2 hours. If it is refrigerated longer and is too hard, let it sit at room temperature until it can be easily rolled. Place the cocoa powder in a bowl and dust your palms with cocoa. Use a candy scoop or a small teaspoon to form 1-inch balls of ganache. Roll them between your hands to get them round. If they start sticking, dust the balls with a little cocoa powder. Repeat until all of the truffles have been formed. Store Bananas Foster Truffles in an airtight container at room temperature for up to two weeks. For best taste and texture, allow them to come to room temperature before serving.